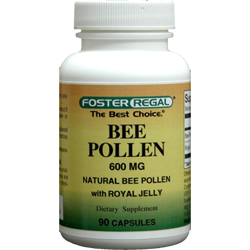 Bee Pollen and Royal Jelly are natural sources of many nutrients. Our Bee Pollen is a fine powder that supplies many vitamins including: B-1, B-2, B-6, niacin, pantothenic acid, inositol, vitamin C and the fat soluble vitamins A and E. Honey bees natural instinct is to harvest only the purest and healthiest pollen available. Once the pollen is gathered it is mixed with flower nectar and bee saliva to form an all natural and highly nutritious food containing vitamins, amino acids, trace minerals and enzymes for a balanced source of bioavailability energy. Royal Jelly is reserved for the Queen Bee, rich in powerful nutrients it enables her to grow larger and live much longer than worker bees. Our Royal Jelly is a fine powder that is lypholize (freeze-dried) to maintain maximum freshness and stability and is tested for the natural factor known as 10-HDA (10-hydroxy-d-decenoic acid) a powerful active component in Royal Jelly. Now you can enjoy the "Natural nutrients from Mother Nature".